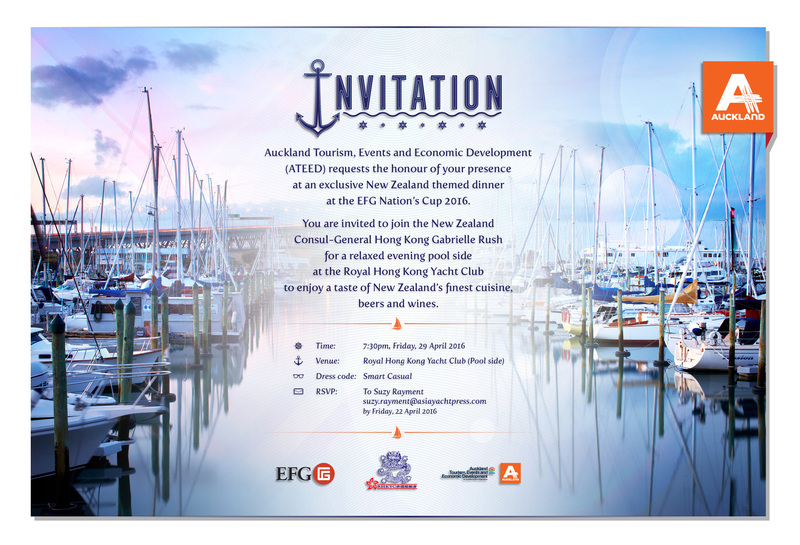 Auckland Tourism, Events and Economic Development (ATEED) looks forward to welcoming you to an exclusive New Zealand themed dinner on Friday April 29 at 7:30pm in celebration of the EFG Nationsâ€™ Cup. The dinner will be hosted by the New Zealand Consul General Hong Kong Gabrielle Rush and will be held at the poolside at the Royal Hong Kong Yacht Club in Causeway Bay. The Nationsâ€™ Cup is a sailing regatta contested annually representing a battle on the water between nationalities. Now in its fourth year and with sailors racing under their nominated flags, it has been likened to â€˜the Rugby Sevens on Waterâ€™. At the dinner we will be celebrating New Zealand having won the last two races, and (hopefully) continuing their winning streak when the Nationsâ€™ Cup 2016 takes place on Sunday 1 May.